With the exception of the legless lizards, lizards often get generically described as the four legged members of the Order Squamatareptile, which includes both snakes and lizards. Lizard trivia often begins by defining the group’s extremes. The Komodo dragon starts that particular conversation with the note that its up to ten foot frame makes it the world’s largest lizard. In historical content, ten feet is a bit small compared to some fossils found in Queensland, Australia, which show an extinct species, Megalania prisca, that measured some twenty feet long and possibly weighed in the one thousand pound range. 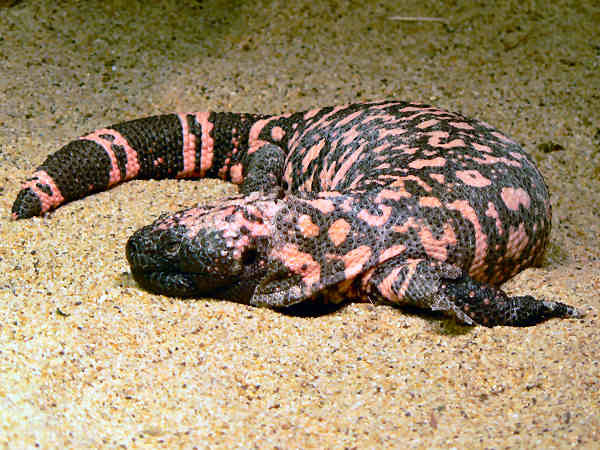 North American’s largest lizards, Gila Lizards, grow up to two feet in length and weigh in over the five pound mark. The types of lizards in the United States currently breaks down into fourteen families consisting of a total of one hundred and twenty two different species. 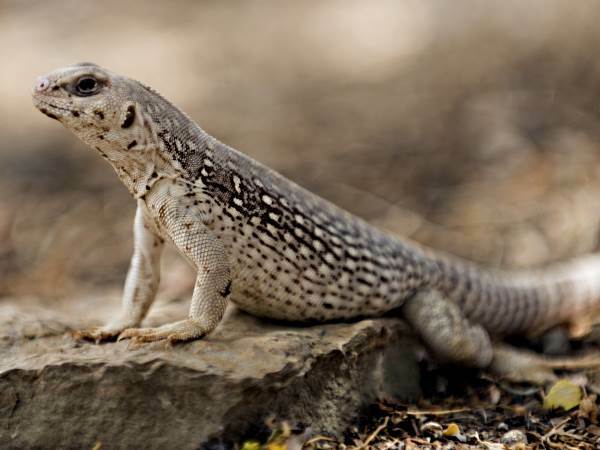 While the numbers may sound a bit intimidating for the average person who wants to learn a little bit about the lizards in the neighborhood or nearby hiking spots, a closer look at the numbers show that about two-thirds of all the lizard species belong to three very common families, the spiny lizards, whiptails and skinks. Other families such as the Gila Monsters (Helodermatidae) pictured at the top of the page have only one member. It’s the only poisonous lizard found in the United States and is a resident of the Southwest Desert. With the exception of Alaska, lizards inhabit a variety of areas across the United States. Their affinity for warm climates makes the Southwest prime lizard territory. Florida also hosts a large number of lizard species, many of them are non-native species. Dietary habits vary from family to family. Most iguanas, for example, are herbivores. They consume only plant life. Spiny lizards, omnivores, consume a variety of insect and plant life. Spiny lizards (family Phrynosomatidae), the largest native North American lizard family, consists of some forty five species divided into nine genera. 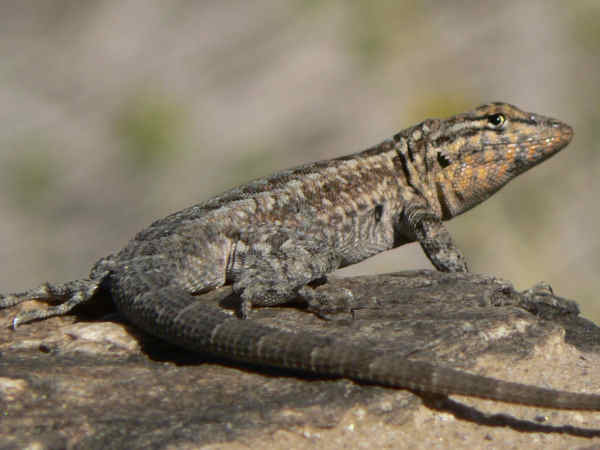 The Side-blotched Lizard (Uta stansburiana), inhabits arid regions of western North America. The side blotch refers to the black spot behind the front leg of the lizard. The Uta genus was named for Utah, the state where they were first discovered. While skinks (Scincidae) rank as the world’s largest lizard family, the fifteen native skink species constitute a small portion of North American lizards. 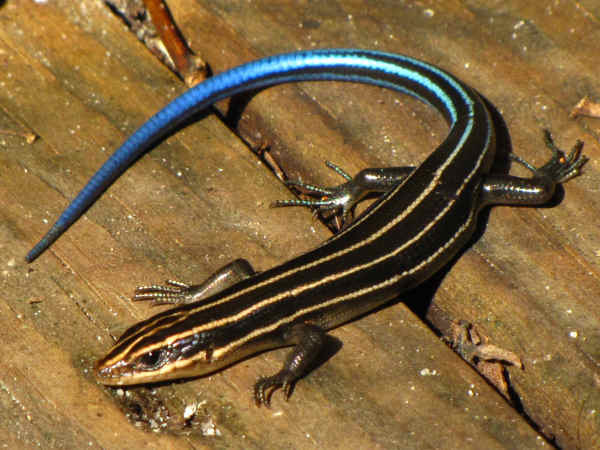 New England’s only native lizard, the Five-lined Skink or Blue-tailed Skink (Eumeces fasciatus), a wide spread woodland species, ranges from Southern Canada to Central Florida. Juveniles, like the specimen in the picture, have dark bodies with five light stripes, along with the blue tail. Mature males also lose their stripes and develop a red head. 21 of the 122 lizard species, or about seventeen per cent, belong to the Whiptails, Racerunners & Ameivas family (Teiidae). They get named for their characteristically long tails, and they can be further identified by the stripe and spot patterns on their bodies and legs. 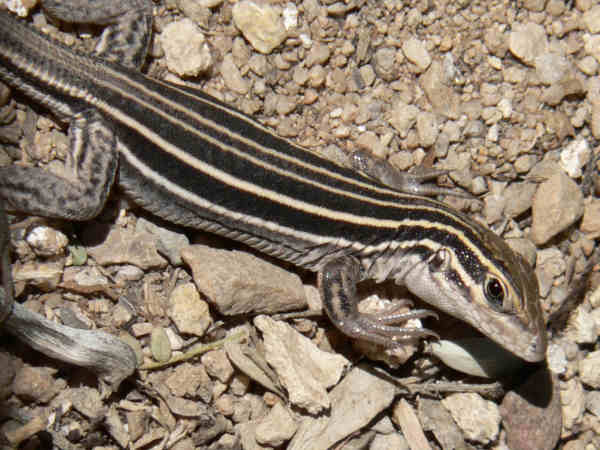 The Desert Grassland Whiptail (Aspidoscelis uniparens) in the top picture, for example, is identified by the six yellow stripes that run down its back and sides. The body lacks spots. It ranges through much of the Desert Southwest. Hundreds of Anole species (members of the Anolis genus) inhabit tropical areas of the Caribbean, Central and South America. The Green Anole (Anolis carolinensis), the only native North American species, inhabits back yards and forests across the Southeast. The slim, lime green body makes it a relatively easy native lizard to identify. Finding one, or a pair, in the backyard should be considered a sign of good fortune. They are considered beneficial lizards, helping keep the yard clean by hunting bugs during their usual day time outings. 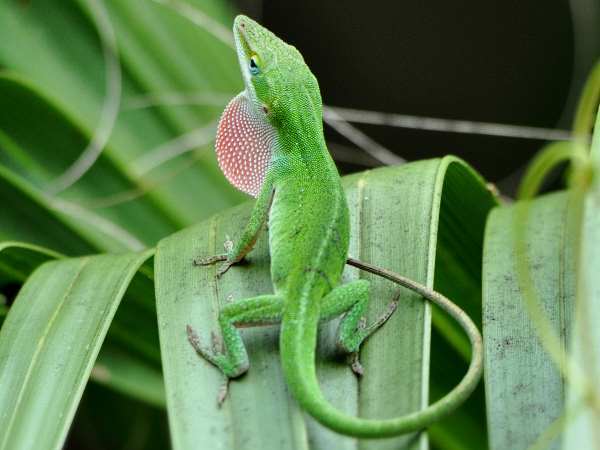 Keeping the yard pesticide free helps promote an anole friendly yard. The existence of two separate families of legless lizards speaks to the importance of physical attributes when taxonomic decisions get made. So it is with the family Anguidae that consists of both Alligator Lizards and Glass Lizards. They share some common physical features in skull and bone development, hence they are placed in the same category. The United States hosts five alligator lizard species and four glass lizard species. 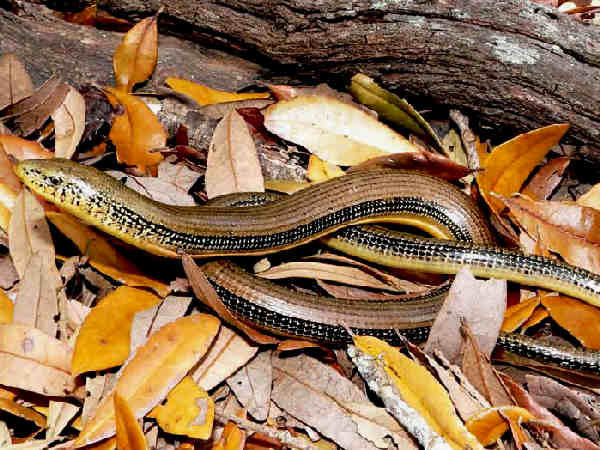 The picture shows an Eastern Glass Lizard. Legless lizards (Anniellidae), on the other hand, belong to a separate family. 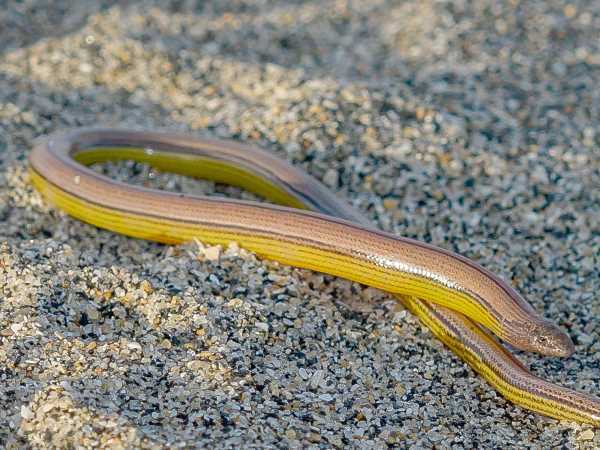 How are legless lizards different than snakes? There are physical and behavioral differences apart from the similarity of lacking legs. Unlike snakes, legless lizards have external ear openings and movable eyelids. They also typically spend their entire lives underground. They are California endemic species and recent research documented the existence of the newer species. Depending on the age of the source, Collard and Leopard Lizards are classified as a subfamily of Iguanas or as their own family, Crotaphytidae. 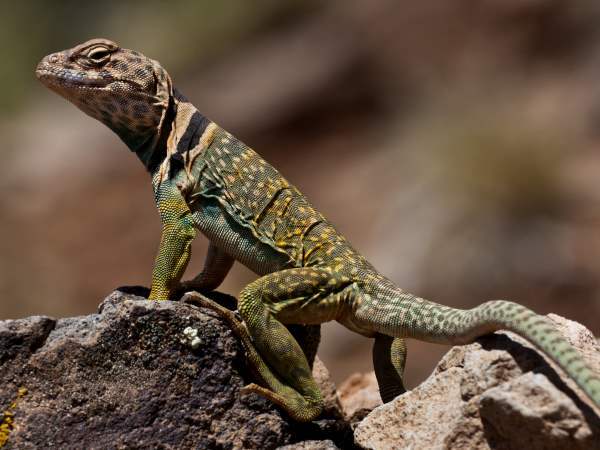 All five collard lizard species and three leopard lizard species inhabit the desert Southwest region. They can grow to be almost a foot in length. As the picture shows, the black rings around the neck form what looks to be a collar. Here’s a Blunt-nosed Leopard Lizard. It’s another California endemic species. 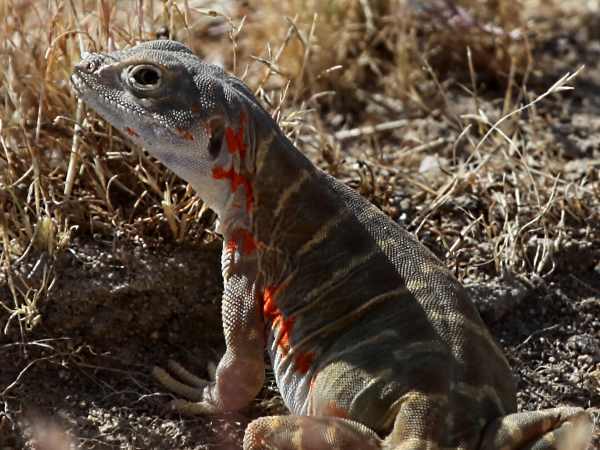 Only two Iguanas (Iguanidaeclick) species, the Desert Iguana and the Common Chuckwalla are native to the United States. That would be the beginning and end of the story if not for the popularity of Iguanas as pets. In Florida for example, many of the pet Green iguanas have been released into the wild and for the past couple of years they have been creating a bit of a havoc in South Florida where they have become established. They are a tropical speices native to the Caribbean, Central and South America. At issue is the fact that they can grow up to five feet in length. While they are not dangerous, they are herbivores that can consume large quantities of common landscape plants and fruit (except for citrus). 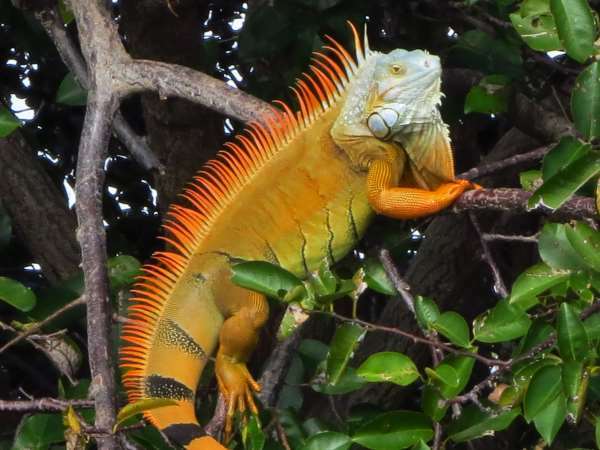 The picture shows an orange colored male iguana. They take a few different forms. The top picture shows a Desert Iguana, one of the native species of the Southwest. What’s not to like about Gecko’s? Cute reptiles with sticky feet that allow them to walk on walls and ceilings in their territory. The United States has three native Gecko families that consists of six species. 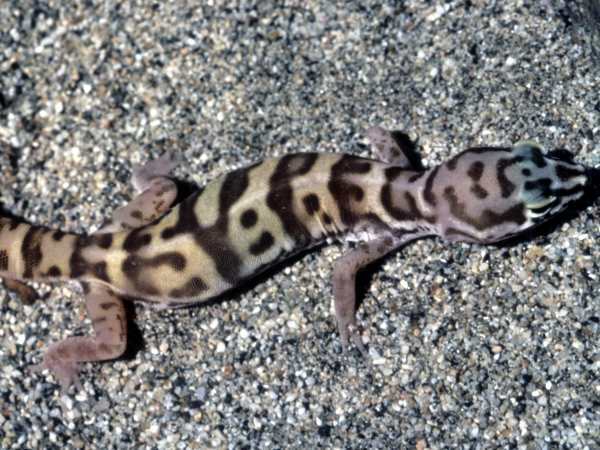 The picture shows a Desert Banded Gecko, a subspecies of the Western Gecko. It belongs to the Eyelid Gecko family. Florida documents fifteen different species, all but one is non-native, the Reef Gecko. Night Lizards (Xantusiidae), not pictured are the final lizard family in the United States. They are fairly small flat lizards. They received the nickname night lizards because people thought they were nocturnal. Turns out they do have a day life. It’s just the fact that their small size means no one noticed them.